The Charlotte 49ers men’s soccer team behind a first half goal by Luke Exley blanked Furman 1-0 on the road in its final non-conference game. The 49ers are unbeaten (6-0-2) in their last eight games. 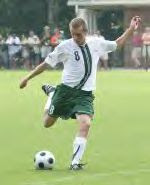 Exley scored the game’s only goal when he blasted a shot from 25 yards out into the top right corner of the goal off an Adam Gross assist in the 36th minute. Exley’s goal was his third of the season. Gross’ assist was his fourth of the season which tied him for the team lead. "We have had an incredible start to the season," said 49ers coach Jeremy Gunn said. "We have worked really hard and to go 6-1-2 in the non-conference portion of our schedule with six tough road games is fantastic. Now our team has to draw a line and get ready to attack the A-10 schedule." Charlotte returns to action next weekend, hosting Atlantic 10 rivals George Washington on Friday and Richmond next Sunday, both at Transamerica Field. Ranked #22 in one poll. heck yeah! back to the glory days of the late 1990s- we should have been running the A-10 for several years now (alongside St. Louis of course)... Congrats Niners!